My girls share a room, and space is limited in our house. Not to mention that I did not have a couple of extra hundred to drop on a dollhouse. 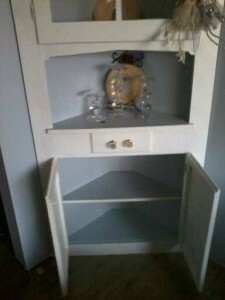 The solution, convert a corner hutch into one. This was the perfect solution for us, because A) it was free (minus the furniture, and B) it did not take up any additional space. In fact we can close the doors, and close the mess away at the end of play time. 1) First stop was to our local dollar store to grab a few new dollhouse furniture pieces to make it look like a real dollhouse. We had a few pieces already and so it costs us $4 for this trip. 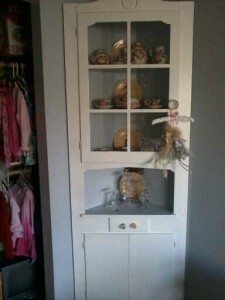 2) Be sure your hutch or piece of furniture is secured safely to the wall before turning it into a play piece for your kids (hopefully you did this anyway – and did not have to learn the hard way like we did. Mine tipped (we kept ‘meaning’ to get to the securing to the wall step – but put it off to long). I lost all the beautiful china set you see in the doors (we got from Mexico), but was so thankful that my kids were ok, I did not even care. DO NOT SKIP THIS STEP!! 3) I then hit my fabric bin (you could use hand me downs or napkins, or whatever you have on hand). I cut out a rug for the living room, and curtains. The window was made from a 3×5 index card, and the valance is a barbie skirt we had on hand. We used scotch tape, to tape it all up, and to secure the rug to the floor. We added an old Target gift card in fun colors to the wall as a picture. 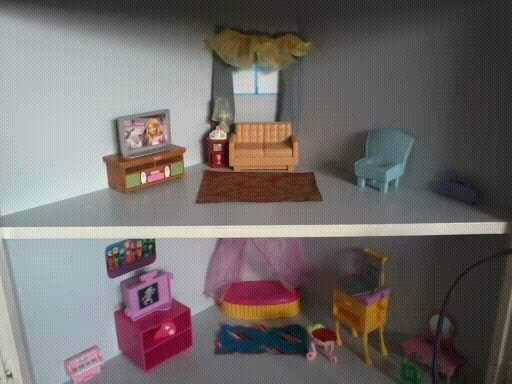 You could be alot more creative then I was, and really trick your dollhouse out! 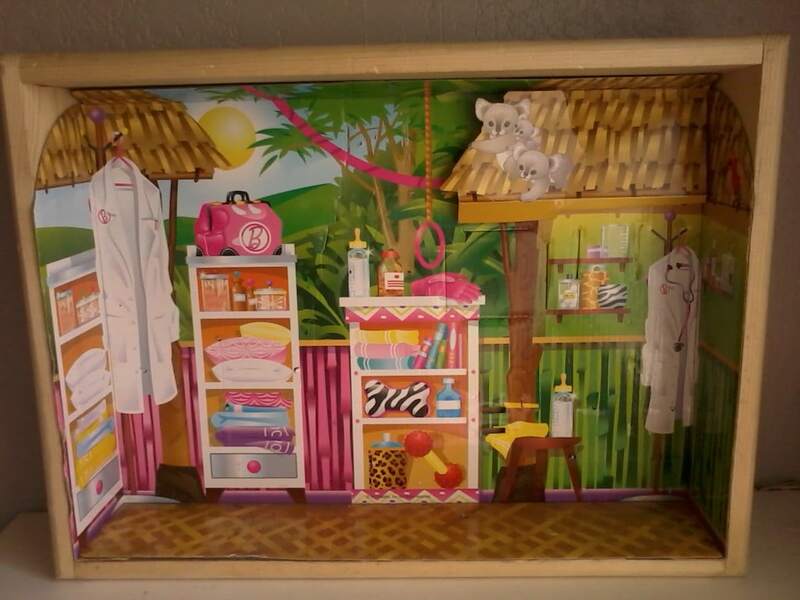 5) Recycle an old basket or container to hold the dolls and more furniture in, so they can arrange and rearrange the space, and boom – you have a dollhouse! 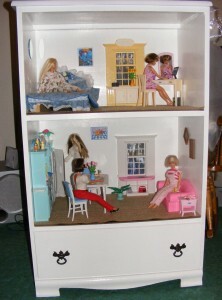 Our dollhouse is too small for barbies, but its perfect for all of the Petshop toys, pollypockets and other small dolls they have. Now I have a built in craft time too….we can always make new rugs, pillows. blankets, curtains and anything else we can come up with on a rainy day. To address the barbie issue, I took a barbie box that one of the kids barbies came in (the box they are packaged in when you buy a barbie) and asked grandpa to build them a box to the dimensions of it. He built a wood box out of scrap materials, I put the barbie box in, and we just set it up next to the dollhouse, and now they can play with barbies, pollypockets, and whatever other toys they want to. Cost of this free! 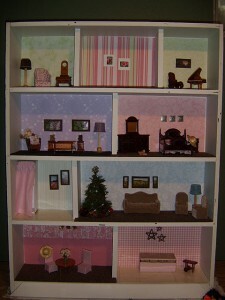 How The Happy Housewife used scrap book paper to convert a bookshelf into a doll house. 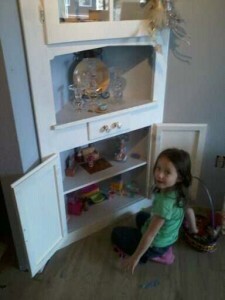 My daughter loves your design and we will be recycling some wood and create a small doll house together with his dad.